We had my little 30th Anniversary run Friday evening. A small group but that was OK because the ones that showed up are my best friends and that's what best friends are for. Jenn surprised me with the little cake. No, I'm not 30 years old, just lucky enough to be able to enjoy running that long. It was a very hot day, still about 92F and muggy when we ran but it was great little trip down memory lane. We took a short break during the run to check out the old house I lived in at the time I started. Saturday Morning was the Race for the Cure 5K. 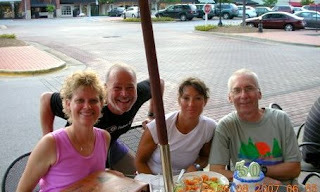 I ran with Karla again and her husband Frank and Jenn ran with us this year. Jerry decided not to join in this year. It is always so inspirational to see the survivors and so many supporters at this event. And especially sharing the run with Karla. Last year she was in the middle of chemo so she was feeling a lot better this year. She was over 6 minutes faster than last year and her fastest run a long time. She'll be back better than ever before long. Jenn ran with us and then walked with her mother, another survivor in the women's only event and then ran the open with her Dad. I just goofed off and rested the remainder of the weekend. I felt fine and had plenty of time but I'm trying to stick to an easy schedule and a proper taper for WSER. More on that later.